Angelo was absolutely fantastic— knowledgeable and engaging, with a wonderful sardonic sense of humor. He was five stars plus! But Viator mislead us by suggesting that we could go inside the cathedral. That was false advertising — full stop. But that wasn’t Angelo’s fault. I found this tour to be a nice balance of art history and orientaion to Florence City. 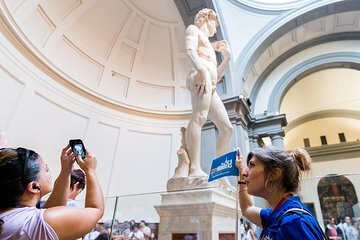 The guide, Daniela, was very knowledgeable about art history, the Florentine Renaissance masters, in particular Michaelangelo, and was engaging and interesting throughout the tour. Annette was our tour guide for this trip. She was very welcoming and kept us informed every step of the way. We had reduced waiting time to see “David” and the lines were very long. Highly recommend this orientation tour of Florence! Paulina was a fabulous guide. She was very informative, interesting, professional, and engaging! We loved learning all we could from Paulina about the history and tips she had to offer on this amazing city. I booked this tour just the day before upon arrival in Firenze and was glad we got one. We met at Piazza San Marco as instructed and immediately we were grouped with our respective guides. Our guide very good, well informed and I liked that she had some anecdotes on the side adding spice to her narratives. Our walking tour was good covering important aspects of early history of Medici influence . The Academia Gallery tour was also quite good, I like the tour on the development of piano and violin. And lastly, the tour of David was well explained, detailing how Michelangelo carefully created each sculpture in the room and not just rushing to the statue of David which again was well explained. This is my third country using Viator tours and I was not disappointed. Skipping the line to get in to the Accademia Gallery and see the David is the best way. Our tour guide was Valentina. She was so knowledgeable and educated us about Florence, Michelangelo, the history, the art. It was a great tour. We highly recommend it. You can take photos of David- no flash. Wear comfortable shoes. Great way to Get lay of land for first visit to this beautiful city. About 12 people. She took us through Acadamia to see Micheal Angelo’s (the authentic) David. A copy sits outside The Uffizi museum. Quite different. She talked clearly, was easy to understand and made sure everyone could hear her well. Extremely informative 3 hour tour!She then took us through the city pointing out specific facts regarding the ancient architecture that abounds in Florence. Worth the time and cost of a well guided tour. Worth the money. Great guide. Suggest making this tour the first of the visit to get an overall perspective of Florence. We enjoyed our tour so much. We learned so much more than we could ever have gotten just from going on our own.